Activial built on his promising British debut by pulling three and a half lengths clear in the betbright.com Adonis Juvenile Hurdle at Kempton. The 9-4 favourite saw his odds halved for the JCB Triumph Hurdle - but trainer Harry Fry issued a note of caution about his participation. Second to live Cheltenham hope Calipto at Newbury in November, the grey took time to build momentum but was going away at the finish. 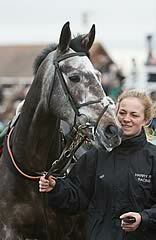 The trainer said: "Noel Fehily's first words were 'not necessarily a Triumph horse'. He'll stay in the race, and we'll see. The Aintree race is worth aiming for as well, but I've not made my mind up. Cheltenham this year might be a year too soon. "I'm delighted with him. The Newbury race was the best juvenile this season and he looks a lot stronger now. There's lots to look forward to. He's got a great attitude, he loves to jump and gallop." "We're thinking EBF Final at Sandown," said Nicky Henderson after the emphatic win of Full Shift (5-2) in the Jockey Club Handicap Hurdle. John Ferguson's Aqalim (2-1) narrowly preserved his unbeaten record with a nose success over Colin's Brother in the racinguk.com bumper. Ferguson said: "We'll see how he is, he might be a horse for the Aintree bumper if he grows up. Otherwise we'll put him away as a novice hurdler for next year."